(L-R) Alexey Dodsworth Magnavita, Carlos Orsi, Jorge Luiz Calife, and Fábio Fernandes. 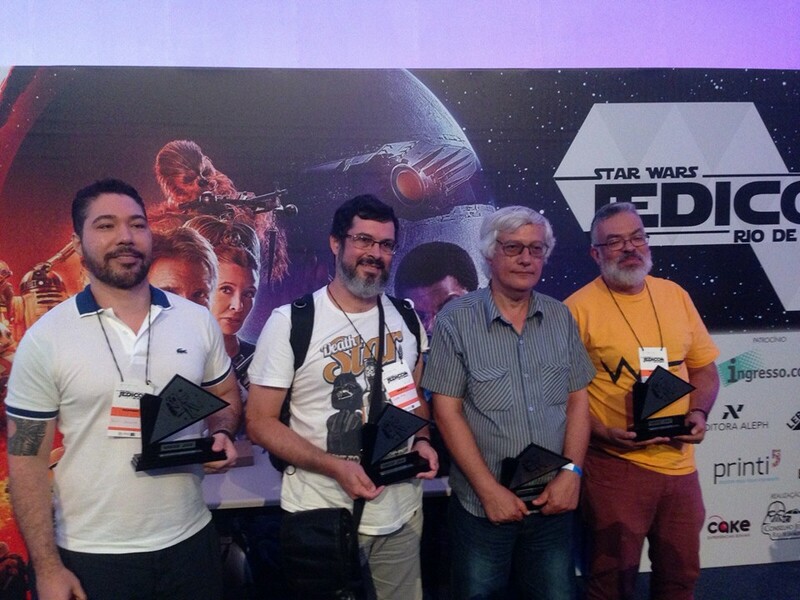 The 2015 winners of the Prêmio Argos de Literatura Fantástica, sponsored by Brazil’s Clube de Leitores de Ficção Científica, were announced November 29 in Rio de Janeiro during JediCon Rio. The award recognizes science fiction, fantasy or horror originally published in Portuguese and is given in three categories: Best Novel, Best Short Story, and Best Anthology. Click on the link for a full list of all finalists. This entry was posted in Awards and tagged Alexey Dodsworth Magnavita, Carlos Orsi, Fabio Fernandes, Jorge Luis Calife, Prêmio Argos by Mike Glyer. Bookmark the permalink. Fun fact: Alexey Dodsworth Magnavita sued a TV network for being unfairly kicked off an Amazon-themed reality TV show, and won. Dezoito do Escorpião looks like a fascinating book – paranormal, indigenous culture, astronomy and horror. I wonder what the chances might be of seeing an English translation.